Dungeon Keeper • View topic - Continuous disconnections during Tournament weekends. Continuous disconnections during Tournament weekends. Re: Continuous disconnections during Tournament weekends. It looks like the disconnects I'm getting are not to do with internet speeds. Nor do any of the enemy's have 0 trophies. All the disconnects are just quitting raids half way though. These were all on easy raids I would have won, so I reckon so far Ive lost at least 1500 stars. Your pings look great. Can you post the graph of an individual speed test? The average speeds aren’t as important as the consistency (dropped/delayed packets). You can see it if you have sudden drops in speed... even if it’s only for a split second, in my experience you’ll get a disconnect. 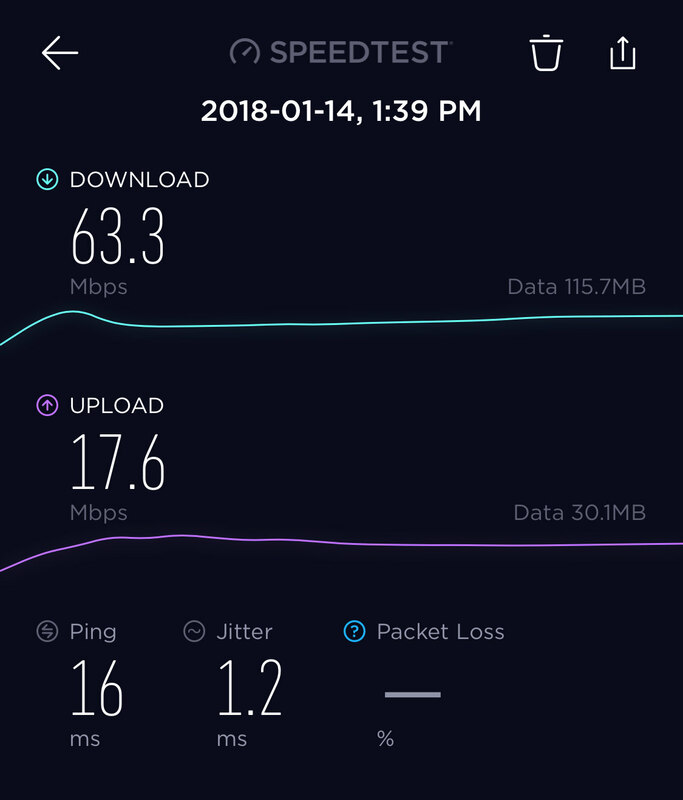 The newest version of Ookla Speedtest shows % of packers dropped, but a long enough delay will also disconnect. Ive put up this data to show not all disconnects are the 0 trophy bug as Chris suggested. This is why I was suggesting saving the state of a players minions/mana/immortals before each raid. so that they can be reinstated if a disconnect happens. This at least would mitigate the problem, as I'm not sure it can be easily fixed, or else the devs would have done it already. Great info. In my version of Ookla, you can click on Results at the bottom, then click on a previous test to get the following. Can you try that? Oh wait, I see, yours has the little green lines underneath. Yes, I agree with you, they look beautiful. The only other thing I can think of is that on my older iPad, I turned off background apps from running, turned off pop up notifications, and turned off automatic updates, so that they wouldn’t try to steal CPU or bandwidth while I was playing. On my newer device it’s not an issue. But I tend to agree with you that it’s probably not a problem on your end. Engineering did get our new cheat-detection up and running before the weekend, but something came up before I could have them look into the 0 Trophy bug. While your results look like that issue isn't necessarily related to your disconnects, I'm hoping that they uncover something that is related during their investigation. Once they start on this task I'll have more info to follow. Sorry I should have already included this... My tablet is a Samsung SM-T580 Galaxy Tab A, bought in October last year. Its fairly decent for a tablet, with 1.6 GHz processor and 2 GB ram, so it shouldn't have any problems running the app. I also don't tend to run other apps whilst playing Dungeon keeper. Thanks for the update Chris (sorry we posted at the same time). Let me know if/when you'd like any more information on this from me. After dealing with this bug for months, every single day, I have finally cracked and quit this game. I lost far too much patience and nerves, not to mention time and donations. It aggravated me every single time when I start playing DK and this bug ruins my will/effort/game-play. I am so sad to leave but this situation that lasts for months every single day left me NO choice. I have made it a habit when I play on my phone to disable wifi, as I have a setup in my home where my phone will switch AP (and sometimes will drop back to mobile data). When on my mobile data plan I never have disconnects. I also play using a WiFi only tablet, but that does not seem to switch WiFi AP (at least not from the sofa, where I usually sit with my DK games) so that does not get the disconnection issues.